There is a club in my town for women who ride motorcycles. Everyone is welcome, whether they ride or not. (There are two members who don't, but they are learning.) We were looking for a name for the club but it just was not working out. It seems we are all too different on the outside. Our bikes are the only thing that we have in common and even those are vastly different. 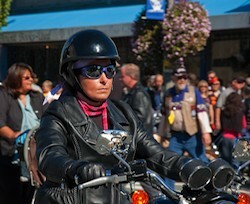 There are two members of our club who are big and bad and scary: the stereotypical biker chick. They are fans of black leather, beefy boys, saying things like "hell yeah" and scaring the beejeebers out of little children. There are two members who are older ladies who learned to ride when they turned 70, much to the protest of their children, grandchildren and others. The one lady did it to piss off the Ladies Mission Club, uptown. She is a pistol and we all love her to pieces. There are two ladies who are so dainty and delicate looking you would swear they were made of porcelain if you saw them. I poked one in the face one day to see if she was real. She was not as amused as you would think. Then there are the rest of us, the goofy, the demented and the silly. The kind of girls that you find yourself sitting next to in class the year your grade point average takes a mystery swan dive for the bottom of the tank. It was my suggestion that we name ourselves Girls with Loud Toys. No one was more shocked when the others accepted it. I am not just a member of this group, I am the one person that brings everyone together. I can hell yeah with the tough chicks and have actually tussled with the biggest of them a time or two. We got up, brushed each other off and have been chummy ever since. The older ladies think I am feisty and fun, and I remind them of their grandchildren. I get cookies and other goodies about once a week. The dainty girls think of me as their wilder spirit and have come to rely on me for advice. I, in turn ask them about skin care products when I think about it, sometimes just to humor them. And, the silly girls know that I can turn loony tunes on them just as quickly as anyone else. I straddle the lines of definition easily but it doesn't matter. We get together and plan road trips and we could care less who shows up to ride with us. (We had an old fellow on a little scooter tag along behind us for a while but eventually he faded off in the distance). You want to ride with Girls with Loud Toys? Everyone is welcome - there are no prejudices here!